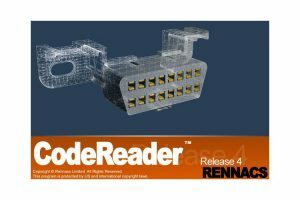 Rennacs CodeReader™ is our flagship software that is at the heart of all our hardware packages. Once installed on your Microsoft Windows™ Laptop or Tablet, full access is granted that will allow you to scan & diagnosis any connected vehicle. CodeReader™ software is under continuous development and is updated on a weekly basis with new vehicle protocols. This means that once you have purchased Rennacs CodeReader, you do not have to manually go through any updating process. You can be rest assured you have the latest diagnostic tools available. You must purchase one of our Hardware Packages to get a full registered version of Rennacs CodeReader™. However, we provide a trial version of the software that will allow you to have a look around before deciding to purchase.